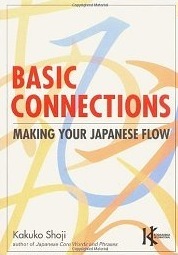 Basic Connections: Making Your Japanese Flow by Kakuko Shoji is a grammar textbook for the transition between beginner and intermediate Japanese. It contains a large number of Japanese sentence patterns, each one with a detailed explanation including warnings about common errors. When a sentence pattern is mainly used by only one of the genders, it is indicated. This is very useful if you are male but your Japanese teacher is female, as is often the case. Kakuko Shoji taught Japanese for over thirty years at the University of Hawaii at Manoa so she’s very familiar with the sort of mistakes non-native speakers of Japanese make. Nine exercises with answers are included, making Basic Connections ideal for self-study. Buy it from Amazon for only $11.05, saving $5.95 off the regular price!